Passport Photo Place takes and processes US citizenship photos while you wait within 15 minutes. We can provide US citizenship printed photos and digital file versions taken with a high resolution camera as jpeg files specifically for Form N-400 (Application for Naturalization – USCIS). U.S. Citizenship and Immigration Service advises to use professional legal photo studio services to avoid issues and delays associated with N-400 application processing. Guaranteed photo acceptance! No N-400 application delays. US Citizenship pictures (digital and printed) are produced per specifications provided by the U.S. Citizenship and Immigration Services, Department of Homeland Security. Please wear a solid-colored top/shirt. White is not accepted since the background color for US Citizenship N-400 application photographs must be white. If you wear glasses, only prescription non-tinted glasses are allowed for the photo session. 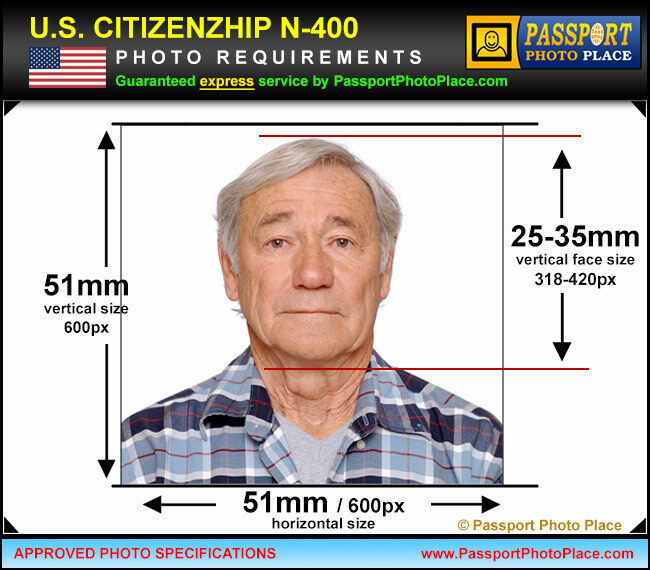 Two identical N-400 photographs must be supplied and taken within 30-day period from the time when the US Citizenship application is filed. The pictures must be printed in full color on a glossy high quality photo paper using a professional photo printer. Inkjet printed photos will be rejected. Prescription glasses are acceptable as long as they do not cause glare in photos and are not tinted. Electronic US Citizenship files can be accepted if printed photos are not available or digital photo files are specifically required for your N-400 application. The digital photographs provided as files must be professionally formatted per N-400 USCIS application specifications. The image must have a 1:1 aspect ratio with minimum size of 600×600 pixels and maximum dimensions of 1200×1200 pixels. The picture must be in full color and encoded in 8-bits per color channel to result in 24 bits per pixel color space. sRGB color space encoding is required. The digital file format must be JPEG and compressed to produce a file size anywhere from 100kb and 240kb. Pictures compressed to produce file sizes below 100kb may not pass naturalization application verification process. Digital files must be submitted with electronic application online in the original form as provided by a professional legal photo studio. Photos cannot be adjusted, cropped or altered in any way. 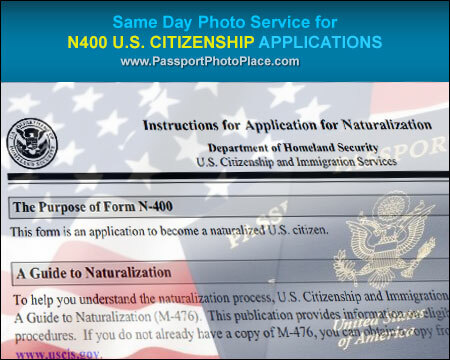 Naturalization application photographs for N-400 US Citizenship application must be taken within 30 days of application submission. If any significant variations in appearance of the applicant are present at the time of application submission, the photos must be re-taken to avoid delays in processing of N400 Naturalization application.